This Indian specialty is so good, I can’t even begin to tell you how. It’s almost criminal. 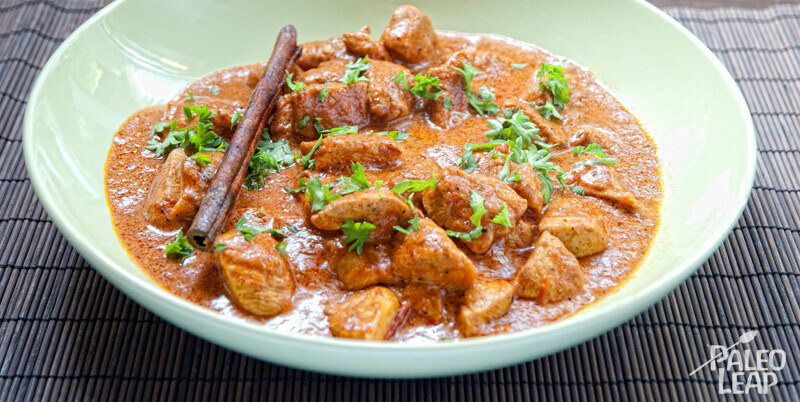 Also known as Murg Makhani, its name comes from the heavy use of savory butter of Ghee (clarified butter). The original recipe calls for yogurt, but we’ll substitute the yogurt with coconut milk, which will be just as good. This recipe is very easy to make and won’t ask too much of your time. You can make it as hot or as mild as you like depending on your preferences by changing the amount of chili powder you put in. The secret to the great taste of this recipe is in the blend of spices used. Heat a pan, add the first 2 tbsp of butter and stir-fry the chicken chunks. You can cook them in 2 batches if your pan is too small. Put the second 2 tbsp of butter and slowly heat the spices for a minute or two until you can smell the aroma. Put the chicken back in the pan and stir so you mix in all the spices with the chicken. At this point, add the tomatoes and simmer for about 15 minutes. Stir from time to time. Add the coconut milk and lemon juice and let it simmer for another 5 minutes. Enjoy without guilt! Garnish with fresh herbs and a stick of cinnamon for extra fanciness points. The best way to always be prepared for recipes that rely heavily on spices like butter chicken is to buy a good assortment of spice all at once. It will seem to cost you a arm and a leg, but it should last almost forever and you’ll never be angry because the recipe calls for that one special spice you happen not to have. Don’t be scared also to play with it and change the spices used and their quantities. Cooking should never be rigid and should always make place for experimentation and tweaks.